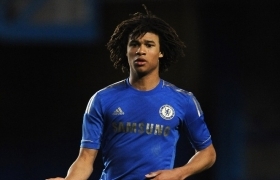 Nathan Ake, currently of Chelsea, is a young player with a lot of promise despite only being 19 years old. The young left-footed Dutchman joined Chelsea's youth ranks from Dutch side Feyenoord in 2011, and has primarily been used in Chelsea's youth sides but has in the past year or so shown signs of making the grade in Chelsea's first team having made a handful of appearances. Ake, is mainly used as a centre back but can be deployed at either left-back or in a defensive midfield role as a ball winning midfielder. I believe his best position in the future will be as a ball playing central defender due to the passing ability he holds and his calmness in possession is really something. Perhaps what Ake must learn is when and when not to play football as a central defender which can sometimes catch the young man out. The youngster who has only managed a handful of first team games for his club, has made his way through all the age groups in the Dutch international set-up from Under-16's right through to the Under-21 level he plays at the moment. Playing in the Dutch set-up I feel can only help young Ake become more successful and improve his game further with the 'total-football' system that's implemented throughout Dutch football. Due to the position he plays and his tender age, I feel that Ake does not have to go looking for first team football just yet, and should be content with whatever first team football Mourinho can find for him at Chelsea. Mourinho definitely will give youth a chance, that's one thing he cannot be criticized for and I truly believe young Ake will be nurtured and improved year on year. For me, it won't be too long until Ake is one of the Premier League's top central defenders and that could well even be before he reaches the top of his game, Chelsea certainly have a talent on their hands here.